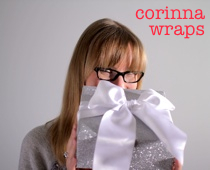 When you’re wrapping a gift for Dad this Father’s Day, look to these eight ideas from the Corinna Wraps archives for inspiration. 2. Smock’s line of printed kraft paper is the perfect selection of subtle pattern for Dad. 5. DIY military-stencilled paper is sure to be a hit. Just change the message to Happy Father’s Day. 7. Decorate Dad’s gift with wood veneer for an unforgettable package. DIY tutorial.